The Filson zippered tote is one of the most versatile bags I’ve ever owned. If there ever was a multi-purpose bag, this is it. I have tons of bags, too many in fact. But one thing I don’t have a lot of are tote bags. Most totes are terrible. Cheaply made with formless cloth, they are only a slight step up from a grocery bag. And while the ladies have a lot of choices when it comes to quality totes, it will take quite a bit of effort to search for the best tote bag for men. 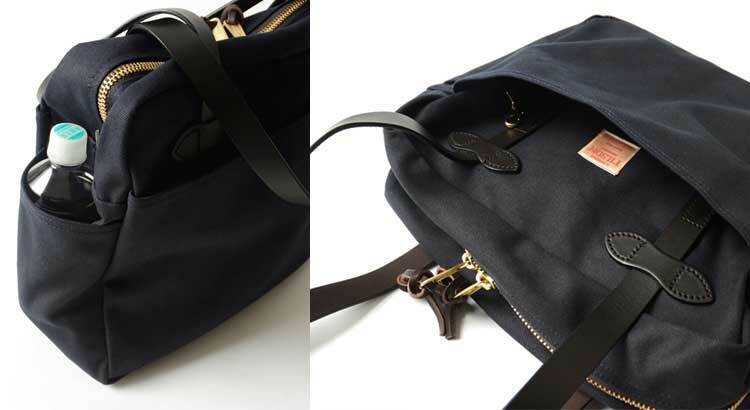 But I think I have found it – the Filson Tote Bag with Zipper. A classic look that will never go out of style. Filson makes two variants of this tote – a zippered one and the subject of this review (style 261) and one without zippers (style 260). Filson also makes two other totes, with a more standard design, and made of another material – the Grab N Go Totes in Medium and Large. They also have two specialty totes – the Wine Tote Bag, designed to carry two bottles of wine and an extremely large Supply Tote, designed for carrying really heavy stuff. 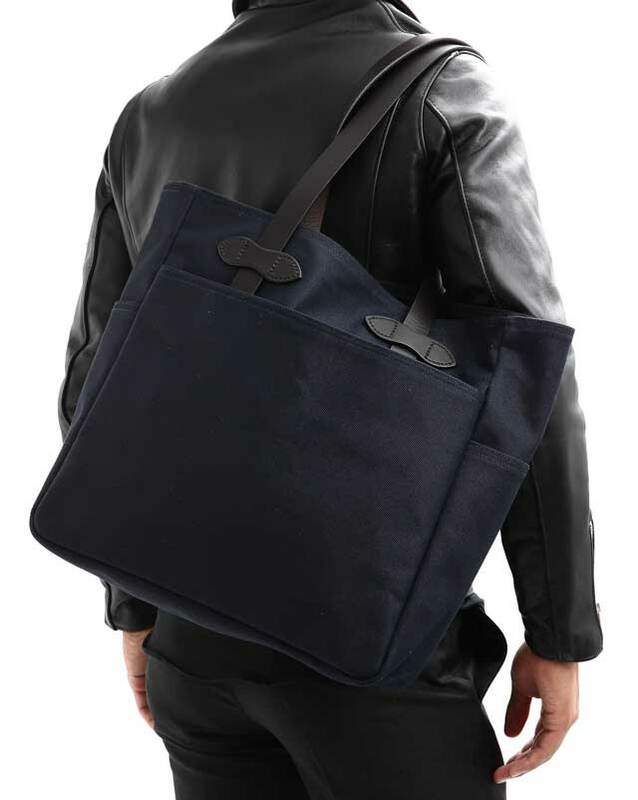 This is the non-zip version of the tote. But the subject of this review is the Filson Tote Bag with zipper. This is one of the best bags Filson makes, and one of the most under-rated bags in their lineup, too. Filson has always been synonymous with rugged quality – and the zippered tote more than lives up to that reputation. 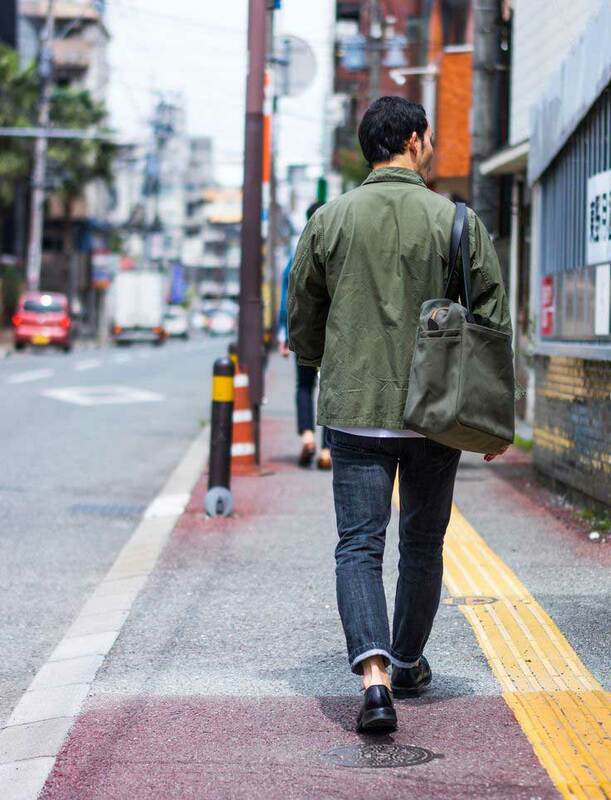 The bag is made with Filson’s classic Rugged Twill fabric which is what most of their bags are made of. It’s an ultra-tough fabric that Filson makes in their home state of Seattle (Yay, made in the USA!). Rugged Twill is also very densely woven, which gives it a natural water resistance and makes for a fabric that can really take a lot of abuse. The fabric is then coated with paraffin wax to add more water resistance. The wax also slicks up the fabric so it won’t be abrasive against your shirts. Some typical bag fabrics (e.g. Cordura) tend to ruin certain kinds of shirts (e.g. merino wool shirts). Another important characteristic of rugged twill is that it develops a unique character as the bag ages. As the breaks in with use, the fabric patina’s and shows its battle scars. No two bags will age similarly. 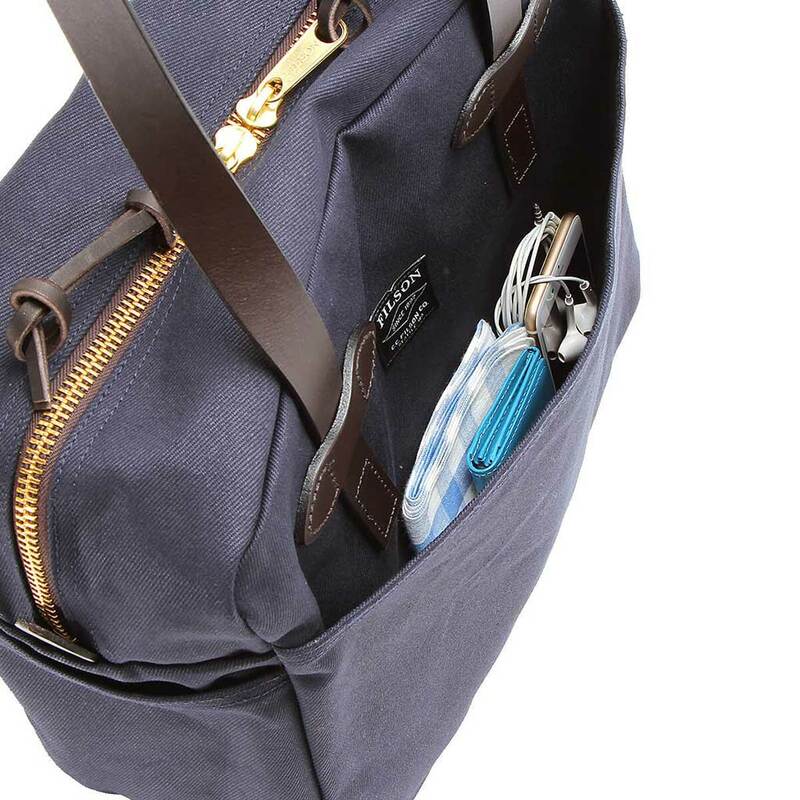 Unlike other bags where dirt, scuffs and stains can render a bag unappealing or even unusable, with the rugged twill fabric, these will only serve to add character to your bag. This is a bag that will grow with you. The handles are made of vegetable-tanned bridle leather. Filson’s bridle leather comes from Wickett and Craig, a 150 year old tannery in Pennsylvania. Bridle leather is saddle-grade leather – it’s the kind of leather typically used in horse saddles. The Filson zippered tote in tan. A simple yet versatile tote. With a generous 14 inch handle drop, the handles are long enough to be carried on most shoulders. There is no other strap, and there is no provision to add a different shoulder strap. The way the leather is manufactured results in a leather that is stiffer and that takes longer to break-in than most other types of leather. But this results in a smoother and more hard-wearing leather with deeper colors. Once fully broken in, the leather will be soft and flexible, without sacrificing strength. The leather is also used in other areas of the bag – but it’s not just for decoration. It’s also placed in areas of high stress – where the straps connect to the bag – helping to reinforce the handles and balance the load. There are also leather pull tabs on each side of the bag, to have something to hold on to when pulling the substantial zippers. There are dual heavy duty brass zippers. And I mean heavy duty. These things are some of the most substantial zippers I’ve ever seen in a bag this size. While they’re a little stiff when new, they do break in and become smooth over time. Once you get used to the zippers on these bag, almost any other zipper is going to feel flimsy. There is also a key holder in one of the external pockets, also made of brass. The Filson zippered tote is a relatively large bag. At 25 Liters, it has slightly more capacity than your standard everyday carry backpack. The size is perfect; when it’s empty it squeezes down to a slim profile and expands as needed. There is no padding anywhere, but the Rugged Twill is fairly substantial that it feels nowhere near like your average cloth tote bag. The bottom has a double layer of twill fabric, which helps in protecting the contents and in adding some structure. It’s not a structured bag, but it’s not as floppy as most totes. It’s also a very simple bag. The heavy duty zippers open into one large compartment. There are no internal pockets or any kind of internal organization. 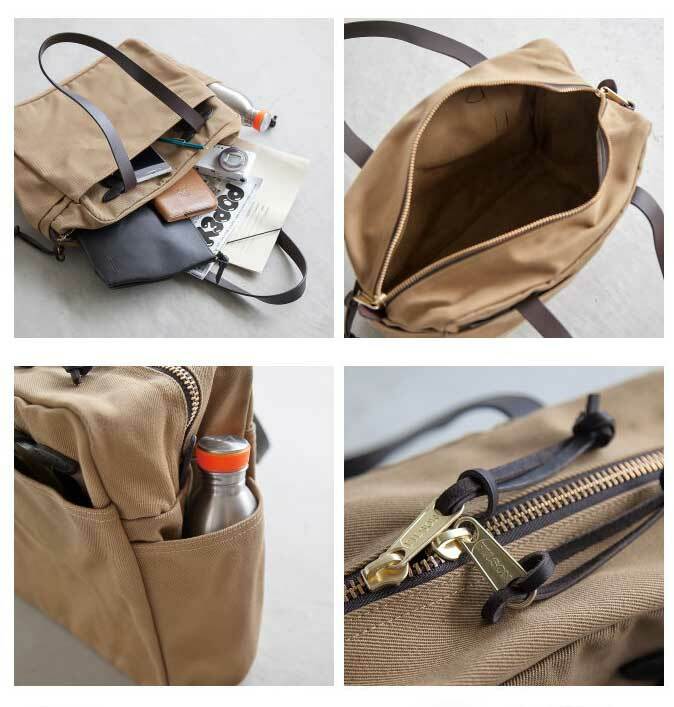 On the outside are 4 quick-access stow pockets (more on these AMAZING pockets in the section below). One on each side that run the length and depth of the bag respectively. There are no zippers to close these pockets. My favorite feature of the bag! Quick access cargo pockets on each side! The decision to design a bag with no unnecessary components or pockets results in a bag that is relatively light yet extremely functional. This is truly one of the most versatile bags I’ve ever used. Everyday carry (EDC), carry-on travel bag, grocery shopping, diaper bag, office bag. This bag has done it all for me. The lack of padding and internal organization means that this isn’t a structured and boxy bag. If you don’t have a lot of stuff in there, it can easily collapse in depth and mold close to your body. But because of the ruggedness and dense weave of the fabric, it’s also not flimsy and formless like your typical tote bag. That (and the amazing external pockets) are what make this bag truly versatile. 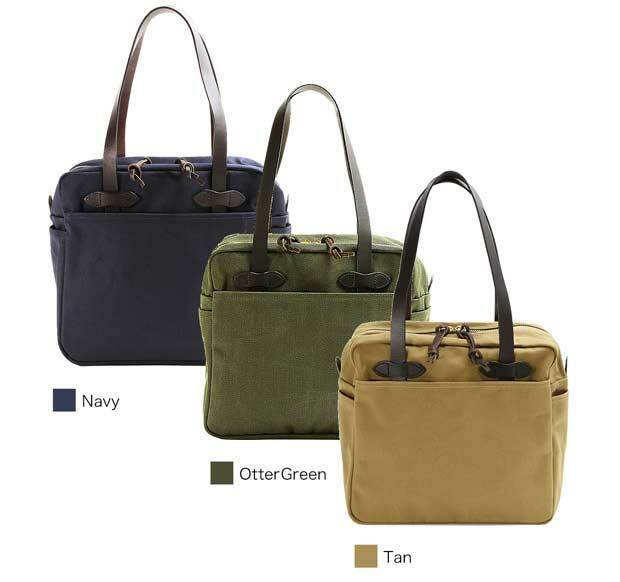 The Filson zippered tote is typically available in 3 classic Filson colors: Navy, Otter Green and Tan. They may do the occasional limited edition run in different colors, but these three are what’s typically available. Because of the boxy dimensions, you can easily maximize the 25 liter capacity when needed. I’ve carried this bag with just the essentials to start the day, then filled it up with groceries or books on the way home. It is a great everyday-carry (EDC) bag. I’ve also used this is a travel bag, though not for one-bag travel. For one bagging, I prefer a backpack. But as a carry-on bag to be paired with checked luggage, this is really good. If you’re a light packer, it’s certainly large enough for onebag travel, but, I won’t recommend it as a onebag travel bag or even as a weekender for clothes. 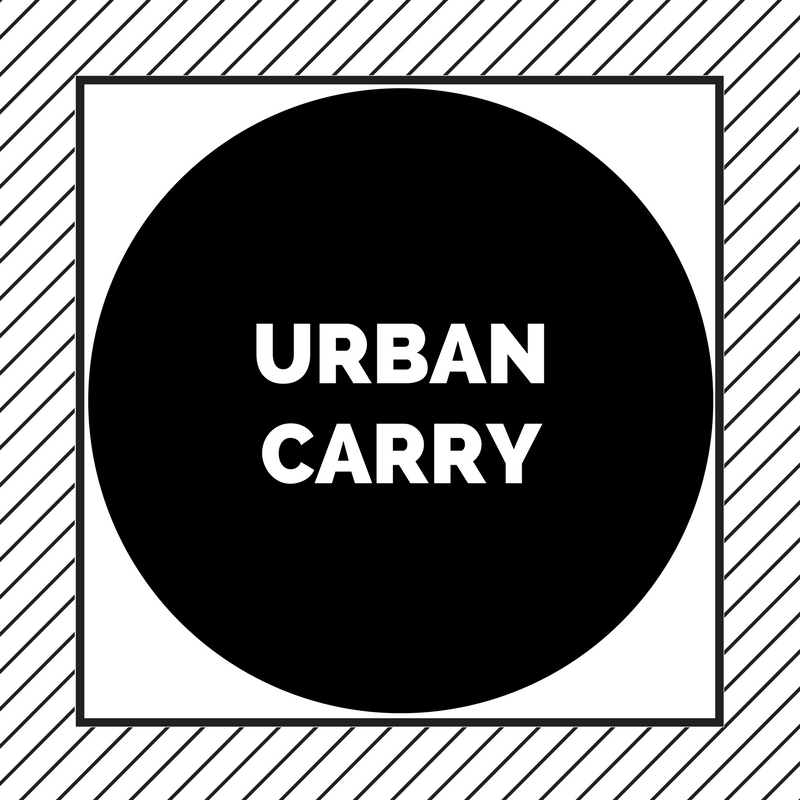 The ability to carry more when needed is a huge plus, but it’s not designed to be carried at max capacity all the time. For travel, it’s best used as a carry-on companion to checked luggage. Don’t fill it up to capacity, just carry the essentials for the flight. The absolute best thing about this bag are the 4 stow pockets. I have no idea why this hasn’t become standard in briefcases or messengers, but the room external quick-access pockets on the Filson zippered tote are game changers. Absolute game changers. These pockets make this bag. All the pockets are cargo pockets – no zippers. As you can imagine, this is fantastic for quick access. Some people may find the lack of zippers to be problematic in terms of security, but I’ve honestly never had a problem with them. They’re deep enough that stuff won’t fall off without you noticing. 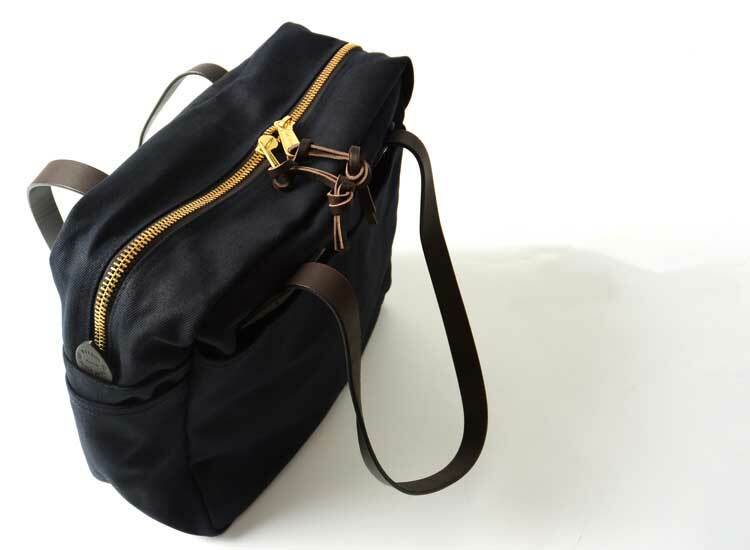 Combined with the nice strap length (which means the bag isn’t sandwiched close to your armpits), everything is within easy access without needing to take the bag off your shoulder. The main outside pockets (i.e. the pockets running the length of the bag) are also fantastic at an airport. They’re big enough to squeeze in a 13″ laptop or iPad plus your liquids bag (3-1-1 bag). This way, everything is within easy access when at security. I’m not holding up the line, fumbling through my bag. I just grab a bin, pull out my laptop and 3-1-1 bag and the TSA just waves me through. The end pockets (e.g. the pockets running the depth of the bag) are tall enough for most water bottles. One pocket carries my Zojurishi Coffee Mug, the other pocket carries a S’well water bottle with no problems. But if you’ve got the bag at full capacity or near-capacity, it might be tough to squeeze in larger bottles in these end pockets. I’ve also used these end pockets for wet umbrellas, and even to store a pair of running shoes (size 9, one pair on each side pocket) after a quick gym session. I love these pockets so much, I think they’re a game-changer. They make my EDC and airport life soooo much easier. Strap length isn’t something most of us consider when buying a bag. But I have to say, the strap length on this bag is near perfect. Since there isn’t any way to attach another strap, I’m glad Filson managed to dial in the perfect strap length here. Good thing about the straps is that they are long enough that the bag sits on or near the waist. The bag isn’t going to be wedged between your armpits like a purse. But they’re also short enough for carrying the bag like a briefcase if it gets too heavy for the shoulder. This is true for most people. If you’re around 5’3″ and below, the straps might be too long to carry as a briefcase, since the bag will almost be touching the ground. The large main compartment has absolutely no built-in organization.Some might find that to be a problem, but personally, I love bags with minimal built-in organization. Having a large empty space allows me to customize the bag as I see fit. Currently, I alternate between a few options, depending on what I’m carrying, and on how light I want the bag to be. When I’m carrying my iPad, I use a Lihit Lab Bag-in-Bag organizer (10″ x 13.8″), which is a great little sleeve that adds a ton of organization – pockets and a small admin. section. It’s got minimal padding but it doesn’t add a lot of bulk. I also usually throw in my trusty Bagsmart organizer pouch for taking care of some cables and other small EDC stuff. If I’m travelling, I usually need more organization. Aside from the Bagsmart pouch above, I also carry additional cables (camera chargers etc..) on my 5.11 Tactical 6×6 medical pouch. This is a well built multi-compartment pouch that’s meant to carry first-aid gear, but I find it to be a great cable organizer. My Kindle Paperwhite and other “on-seat” flight essentials go into a Bond Escapade Gear pouch (a rugged and well designed pouch). As long as the Filson tote isn’t completely full, this Escapade gear pouch can actually fit in one of the external pockets. I usually place it in one of the pockets just before I board the plane. Once I get to my seat, I can easily grab the pouch and put the bag in the overhead compartment. My biggest issue with this bag is the width of the straps and the lack of an option for a shoulder pad. I wish they’d made the straps wider, which would really help with comfort when carrying heavy loads. There also isn’t an option for a shoulder pad. In fact, Filson doesn’t make a shoulder pad for any of their bags. They make a strap with a built-in shoulder pad, but that won’t work with this bag since there isn’t any way to add another strap. I’ve been trying out a few options recently, I’ll update this post with my findings. Another minor flaw is that since the zippers are so big, there’s a chance they might scratch stuff as you pull them out of the bag. Now, I’ve never had this problem. I’ve carried my laptop, my iPad, my Bose QC35 noise-canceling headphones in this bag, and I’ve never scratched any of them. I’ve never felt the need to be extra careful with taking stuff out of the bag either. But, it might bother some people. The only other issue I have with the bag is the lack of luggage pass-thru. I love using this bag as a carry-on bag paired with a suitcase for checking in, and I do miss having a luggage pass through. You can sort of get away with it by looping the Filson’s strap over the luggage handles, but of course it doesn’t work as well as having a real pass-through. Surprisingly, this is one of my favorite bags of all time. Surprising because it’s such a simple bag with no fancy features. It’s a tote slash briefcase with handles and amazing external pockets. It’s just a bag, right? But, those outside pockets? Game changer. This is also one of those rare unisex totes. It’s relatively masculine looking, but it achieves that without any MOLLE webbing or cobra buckles to achieve that look. It’s extremely versatile – a real multi-purpose carry piece if there ever was one. It’s got bomb-proof built quality, and it also looks really good. As with most Filson bags, this is a classic look that will never go out of style. And it will only get better with age. My bag is three years old, only just starting to show its patina and character. It will probably outlive me. 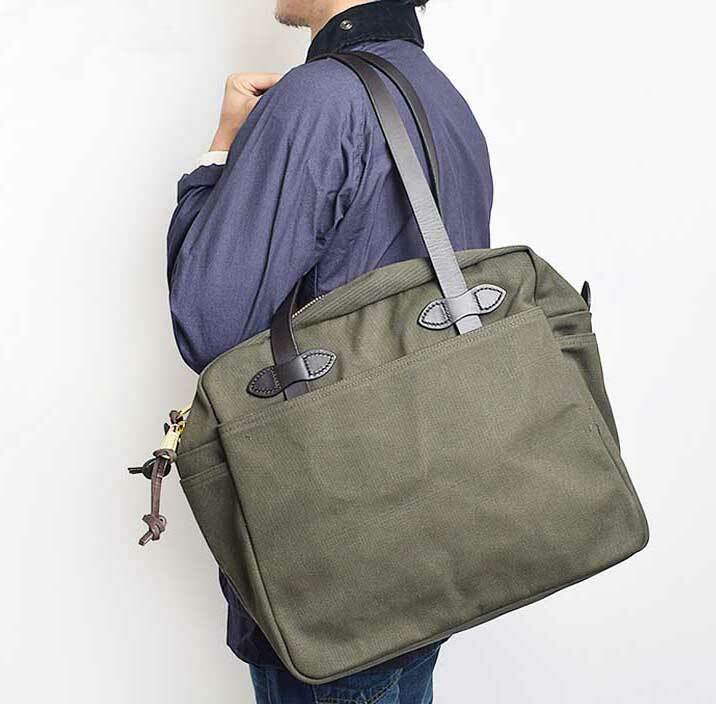 Click here to check out the Filson tote bag with zipper on Amazon or on the Filson webstore. Or if you prefer the non-zip version, you can click here to check it out. Best Gym Bags for any workout in 2018!